When it comes to ordering personal checks, your main deciding factors are likely to be quality, compatibility, and cost. ASAP Checks manufactures and prints only high-grade checks made of premium paper - checks that are guaranteed to be compatible with all US Banks and Credit Unions. Our prices are competitive and economical too, so you'll pay far less than if you order through your bank. And with our 100% money-back guarantee, every purchase is risk-free. Click here to learn more about our No-Hassle Guarantee. Our personal checks are perforated along the top to fit in most checkbooks. There are 200 (8 books) personal checks per box. Each checkbook contains deposit slips and a check register. To ensure absolute check security, ease of use, and your peace of mind, we use a variety of highly-effective security features to prevent tampering, duplication, and other methods of fraud. These features include TouchGuard™, True Watermark, and Invisible Fibers. Whether you are a new or returning customer looking to order checks online, ASAP is the company of choice. Our high level of product quality, helpful customer support, and excellent value for money outshine that of our competitors such as your bank, Deluxe and Harland Clarke - just compare and you'll see! We also make it easy for you to place repeat orders; you can simply sign into your account to save time. What constitutes a personal check? 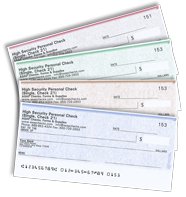 Personal checks are much smaller than business checks, generally measuring 6 1/4 inches wide by 2 3/4 inches high. Due to their more compact size, they are unsuitable for most business accounts. This is because there isn't room to encode a check number longer than 3 digits. Just like any other check, personal checks include routing and account numbers, and personalization such as the account holder’s name and address. There are two types of personal checks - single and duplicate. With duplicate checks, there is a carbonless copy so that everything you hand write on your check shows up on the copy below. You detach the check and the copy stays in the checkbook. Can I make my own personal checks at home? Yes, you can - but in most cases, it simply isn't practical. You would need to purchase suitable blank check paper, magnetic ink or toner, and a compatible laser or ink printer if you don't already own one. Besides the hassle of setting up your check printing operation, there is also the risk of bank service fees if your homemade checks are not compatible! Incompatible checks can incur fees of up to $4 each and delay processing. With our competitive prices and hassle-free process for ordering checks, why would you take that risk? ASAP Checks has quick turnaround, fantastic customer service and loads of security features. Get your checks for cheap at ASAP Checks! Are your personal checks the same quality as your business checks? Absolutely! We manufacture and print only premium grade paper checks for all our valued customers, whether the checks are for personal or business use. We combine our commitment to product quality with fast, reliable shipping and outstanding customer support, to give you the best check shopping experience. It's little wonder we're regarded as one of the most reputable companies in the check-printing business! Place your order today to see for yourself. Can you print your own checks at home? Yes, but it rarely makes sense to print your own at home. Printing your own checks requires suitable blank check paper, magnetic ink or toner and a compatible laser or ink printer if you don't have one already. Note that there is some risk because if the checks you make at home are not compatible, the bank can charge you a service fee for each rejected check (as much as $4 each! !) plus it could delay processing the rejected check. I have always been very happy with the service provided by your company. we have been using you for many years! I have always had very good service with ASAP. Extremely fast delivery of orders.